We were so flattered the first time a company approached us to do a product giveaway that we didn't think twice about saying "yes." We may have even gotten a bit giddy about it. As new bloggers, it made us feel valued to have garnered the attention of large, national corporations. It was exciting. And fun. And sometimes delicious. But, after writing a review or two about products we wouldn't necessarily have purchased of our own accord, we decided we needed to create some standards for the acceptance of free product. After all, this was OUR blog, and it should reflect our values, our tastes. In our case, we decided to focus our energies on supporting locally made products, preferably those that were organic or produced in a sustainable fashion. So, blogging lesson number two for us was: be true to your values. Interestingly enough, we were recently approached by a Chicago-based company called Scrumptious Pantry who was interested in a collaboration. Scrumptious Pantry is a company that takes hand-grown ingredients from family farms in the Midwest, California, and Italy and prepares them in small batches, using recipes that are deeply rooted in the culinary heritage of the region. 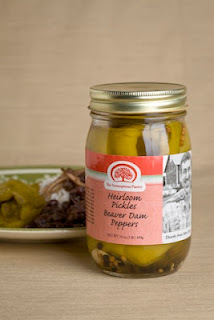 We fell in love with them when we found that they had recently launched a line of pickled heirloom vegetables, including the Wisconsin-bred Beaver Dam Pepper. The mildly spicy heirloom variety was introduced to Beaver Dam, Wisconsin by an Hungarian immigrant around 1913. But, the cultivation of the pepper was soon left on the wayside in favor of more easy-to-grow varietals. The pepper is now listed among 200 fruit and vegetable varieties in Slow Food's Ark of Taste, a catalog of delicious foods in danger of extinction. Fortunately, Wisconsin farmers like John Hendrickson at Stone Circle Farm and Nicole Schauer at Good Earth Farm took up the challenge to grow these peppers and supply them to Scrumptious Pantry. Beaver Dam Pepper Pickles are fantastic eaten out of hand, so you know they also make an excellent accompaniment for cheese or charcuterie. They're delicious atop a pulled pork or Italian beef sandwich, or as part of a Greek salad. 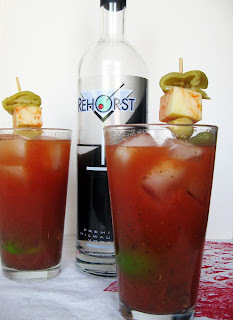 But, they're also extremely tasty as an accompaniment to one of Peef's famous bloody marys. 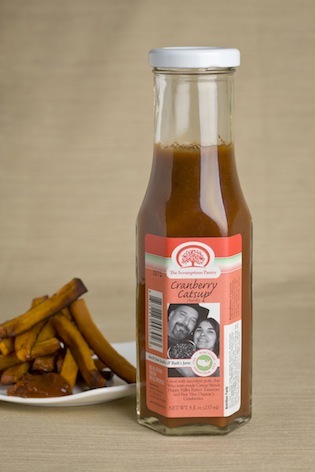 The most recent rendition of this fabulous brunch drink also contains another Scrumptious Pantry product -- their smoky, slightly tangy Cranberry Catsup made with tomatoes from Happy Valley Farm and cranberries from Fine Vine Organics. If you think regular ketchup is good on a burger, wait until you've tried this stuff. Smoky, slightly sweet, and deliciously robust, this is one catsup that's not to be missed. And -- oh! -- did we mention how good it is on sweet potato fries?? As far as catsup in a bloody mary goes... The cranberries add a subtley fruity flavor, while the chipotles add a subtle smoky heat. A bit of brine from the Beaver Dam Peppers takes the drink to a whole new level. Once again, we couldn't end this post without leaving you with a little bit of something in celebration of our 5th Burp-Day. This is the second of five... make that seven giveaways taking place on the blog all through the month of June. So come back often, and come hungry! First-- ALL of our readers can take advantage of 20% off on Scrumptious Pantry's site starting today and going through June 25th, 2012. To take advantage of this offer, use the code EatBurp at the checkout at the Scrumptious Pantry Online Store. Second, three (3) lucky readers will win Scrumptious Pantry gift baskets containing TWO bottles of Cranberry Catsup (one smoky, one earthy) and TWO jars of heirloom pickles (Beaver Dam Peppers and Pickled Beets). To enter, simply visit Scrumptious Pantry and tell us which product in their line you'd most like to try. For a bonus entry, stop by their Facebook page and give them a like. Be sure to leave us a comment letting us know you did just that. Full Disclosure: This giveaway is sponsored by Scrumptious Pantry, who provided us with the products for our giveaway. However, all opinions expressed in this post are our own. I would LOVE to try the sundried tomato spread! YUM! I'd love to try their eggplant spread. I'm a big fan of sauces and would love to try their Cranberry Catsup...but I'd also like to try their Coarse Roasting and Grilling Salt. Oh, man, I'm such a pickle girl and would love a taste of those pickled red beets (and all of it, of course). Sign me up! And I liked The Scrumptious Pantry on Facebook, too. Cheers! Heirloom pickled beets? oh, yeah! That ketchup sounds pretty darn amazing to me! Though I love farro too. I want to try their pickles: the beaver dam pepper sounds great. The eggplant spread looks phenomenal! The eggplant spread for sure. Italian Extra Virgin Olive Oil. I'd love to try the Sun-dried Tomato Spread. They have so many tempting things, especially the vinegars and oils and pastas. Many thanks! The eggplant spread looks amazing sauce! I also liked them on facebook! I'd love to try their pickled beets. I would be interested in trying the farro pasta.